Modeled after the Kz One Standard, the Kz One Junior has been designed to allow easy usage of the unique features of Kz One. 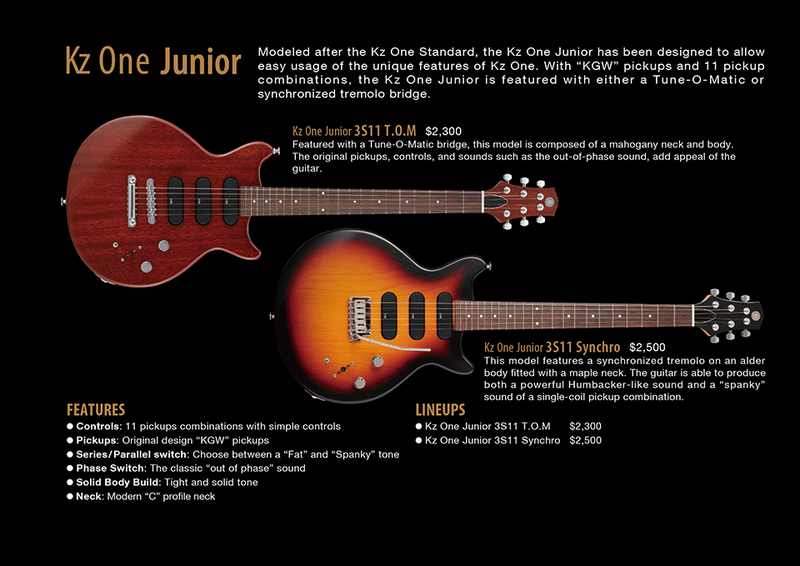 With “KGW” pickups and 11 pickup combinations, the Kz One Junior is featured with either a Tune-O-Matic or synchronized tremolo bridge. Featured with a Tune-O-Matic bridge, this model is composed of a mahogany neck and body. The original pickups, controls, and sounds such as the out-of-phase sound, add appeal of the guitar. This model features a synchronized tremolo on an alder body fitted with a maple neck. The guitar is able to produce both a powerful Humbucker-like sound and a “spanky” sound of a single-coil pickup combination.